The Madagascar Magpie-robin (Copsychus albospecularis) is endemic to Madagascar located in the Indian Ocean off the southeastern coast of Africa. 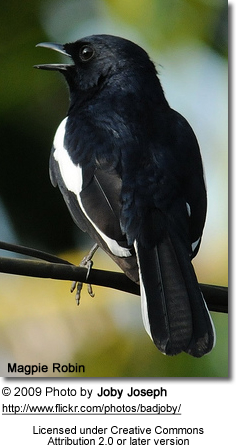 This Magpie-robin inhabits lowland forests. They are thought to be sedentary. They are scattered throughout their range, but relatively common. Their numbers vary by habitat. Mostly feed on insects, such as cockroaches, orthopterans, bugs, adult and larval beetles, and ants), as well as spiders, small amphibians and geckos. Size: Measures about 18 cm in length (from top of head to tip of tail) and weighs between 19-30.5. 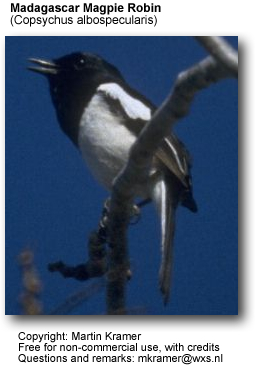 Plumage: males mostly black, except for white shoulder patch and white fringes to the tail. Measures about 18 cm and weighs between 19 and 30.5 g.